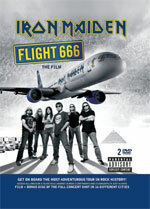 In case you've been living under a rock Flight 666 is Iron Maiden's new DVD/CD set that chronicles the first leg of their massive 'Somewhere Back In Time World Tour' in 2008. I think the most important question to ask when reviewing a documentary about a band of Iron Maiden's status and tenure is 'Is there any new information presented here?' Even if you saw the tour, read about their plane, and watched every other Iron Maiden video and documentary ever made the answer is a definite yes. This DVD is much more than just another Iron Maiden collectible that you'll need to fill out your collection. The premise of the movie is the Iron Maiden airplane that they bought, refurbished, and used to fly themselves to every remote country on the globe. Obviously, much of the �new information� is about the plane, but also how the whole idea and tour came to be. However, there are also a lot of other tidbits that even the most seasoned Maiden fans will find interesting and refreshing. Have you ever wondered what the guys do on their days off? Flight 666 has that covered. How did they get so popular in places like Malaysia and Columbia? Now you'll know. What does it take to set up and move their immense stage props and equipment? You'll see that too. I could keep going but I don't want to spoil the movie for you. Of course, there are clips of songs from every stop on that first leg. Anyone that has seen them live or even heard a live Iron Maiden recording pretty much knows what to expect. The band is always dead on and these selections are no exceptions. The set list is just as impressive with all but the crowd-pleasing Fear Of The Dark coming from their 80's glory days. I have to give two huge thumbs up to Banger Productions on this one. I can't decide which is more impressive - the job that they did in producing this documentary, or the fact that these guys actually got paid to fly around the world with Iron Maiden and film the band's every move. Sounds more like they were the winners of some major Iron Maiden fantasy contest than a job, doesn't it? It's obvious that they took the job seriously though. From filming to editing and everything in between, it is all done very well. I suspect nearly all Maiden and metal fans will see this movie at some point, and they should. I only wish that there were a way to get this out to non-metal fans so they too can truly see the global impact that Iron Maiden has made on music lovers everywhere. They are the only band on the planet that could pull off a tour like this. I suspect nearly all Maiden and metal fans will see this movie at some point, and they should. I only wish that there were a way to get this out to non-metal fans so they too can truly see the global impact that Iron Maiden has made on music lovers everywhere.